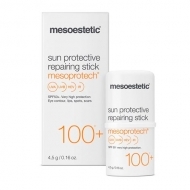 Protects the skin from the sun's rays; Has an anti-aging action. 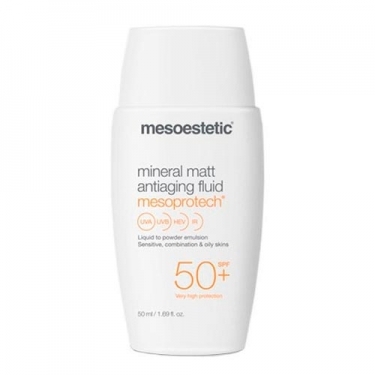 Mesoprotech Mineral Matt Antiaging Fluid from Mesoestetic is an anti-aging light emulsion that offers a very high sun protection. Its formula based on physical filters ensures extreme dermal tolerance for sensitive or battered skin. Its texture provides a powder-like finish on the skin and absorbs excess oil and glitter, making it suitable for oily and acne-prone skin. It contains in its formulation: Collagen pro-47, which protects and enhances the presence of high quality collagen in the skin; Matifying particles that eliminate excess glare and leave a matte, velvety finish on the skin. Non-comedogenic. Ideal for sensitive skin.